Am I an expert when it comes to exercising – no sir. If you need an expert, or real tips from the likes of a personal trainer type o’ person – jog yourself over to Pinterest. Go on … head over there. Oh, you want to hear what this little mama has learned about exercising and accountability and pushing a 100+ pound stroller all around town? Here’s the thing. It’s super easy to say I’m going to exercise. Even more, it’s super easy to let the day get the best of me. To let dishes call my name louder than my running shoes. 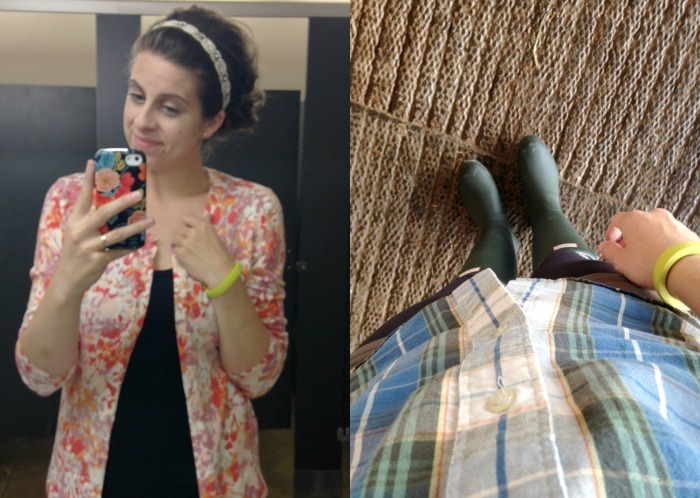 To throw in the towel on wrangling the littles into proper outdoor attire. You name it, I’ve got another ten excuses NOT to exercise. Every day I have a bevy of excuses up my sleeve. Sometimes they win. Sometimes they don’t. More than anything, what keeps me on scheduled is accountability. Oh that A word. The thing we love to hate and hate to love. Accountability keeps me on track. It keeps me progressing. Most of all, it keeps me honest with where I’ve been, where I’m going and where I need to get. 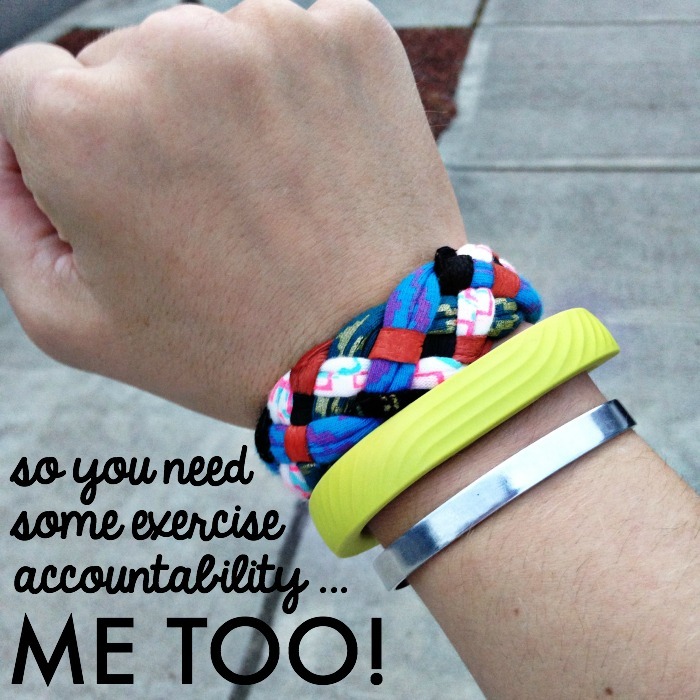 Often we think of accountability as a person we check in with. And yes, that’s good. I text Dominic every time I finish up a run and wait in anticipation for his virtual high five or sweet comment to my post-run sweaty face photo. But, I’ve found a few other things that help me get out the door on a consistent schedule. Here ya go! Exercise with friends /// Over the summer a friend and I met at the local track a few mornings a week. When I woke up and wanted to skip, knowing she was there waiting for me kept my booty on the move. Join a class /// Same memo as exercising with friends. There is a time and place and others are waiting on you. Here’s my favorite class option for mamas. Have an event on the calendar /// When I’ve got a 5K on my radar, I stick to my running schedule. If I don’t, I know I’ll crash and burn and no one wants that. Plan ahead /// Every week when I meal plan I also try to pencil in my exercise times. 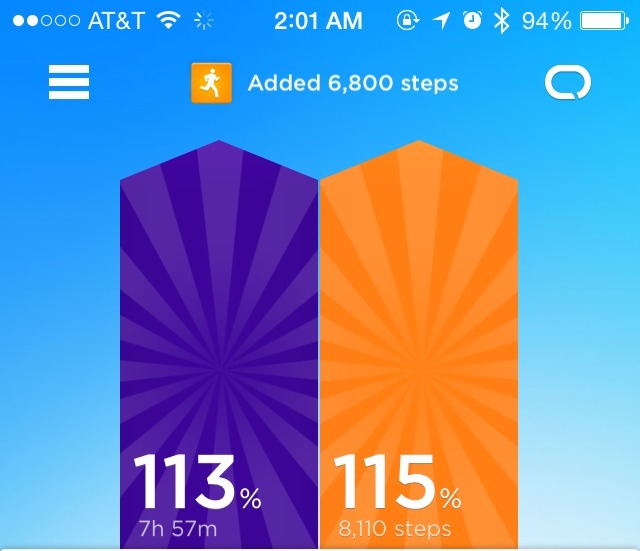 Utilize the UP24 Band /// When I first started tracking my sleep and activity with the Up24 I really had no awareness of how much I was moving each day. With the band I’ve been able to set goals and work towards them on a daily basis. After dinner, if I see I’m a 1,000 steps shy of my goal I’m motivated to take the kids out on an evening walk to finish the day strong. Or, if my nap didn’t push me over my sleep goal I’m a wee bit more anxious to get to bed at a decent hour. Seeing 100%+ completion any given day is totally motivating to me. The simple act of being aware, has been great accountability. The UP24 is working even when I’m not truly exercising. It tracks any movement. I wear it every day … like a chic little bracelet. It’s comfy and works great stacking with other bracelets or alone. If you haven’t invested in an UP24 band for yourself yet you can still benefit from via the app! YES, that’s right! Download the UP24 app and you can gain accountability with not only sleep and exercise, but food too. See … accountability isn’t as awful as it sounds :) For weeks now I’ve been reaching my goal of 7 hours of sleep and 7,000 steps thanks to the tracking from Up24. Most days I’m sipping 100 ounces of water too. Next component I want to tie in is some Whole 30 meals. I’ve got my cookbooks ready to tag some new recipes and hope to get on that sooner rather than later. Wish me luck! Tell me about your exercising accountability. How do you keep on track with your exercise intentions? This post was sponsored by Jawbone. All opinions are my own. Thank you for supporting the companies that support my blog! Wow, that sounds like some COMPREHENSIVE accountability! So much more than just a movement tracker. Great post – I use the FitBit for tracking steps, workouts, caloric intake, water intake and sleep. I love it and its nice seeing my progress. I also have a gym membership, which is great motivation (I’m paying for it so I better get down there!) and stress-relief – Its a break from the kids (sorry, no working out with kids for this mama!) and it’s cheaper than therapy!! I also signed up for a 15k (not exactly sure what I was thinking) so training for that is a MUST because I actually want to cross the finish line!! I love the UP24 Band, an ingenious idea. For me, it’s all about my To-do list. If it’s not on the list, it doesn’t get done.